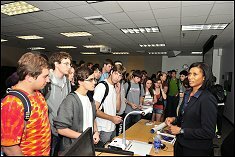 Jeanette Epps speaking with students in ENAE100. On October 23rd, NASA astronaut and Department of Aerospace Engineering distinguished alumna, Jeanette Epps (Ph.D. 00?) returned to Maryland to give a presentation to aerospace faculty, staff, and students. Her presentation, From a Terrapin to the Astronaut Corps, cataloged her transition from a PhD student in the Department of Aerospace Engineering to her current role as a NASA astronaut.